Our white glove services extend even further into the final mile, installing and assembling appliances, fitness equipment and furniture in your customers' homes so they can enjoy — without the headache of complicated assembly. Our delivery team will expertly move existing items that do not require installation to their room of choice. Your customer is at the centre of the final mile universe. We'll coordinate delivery around their schedule with a clear window for expected arrival. Our drivers call within the hour they will be there to ensure that the drop-off time is still convenient and the customer is ready for delivery. 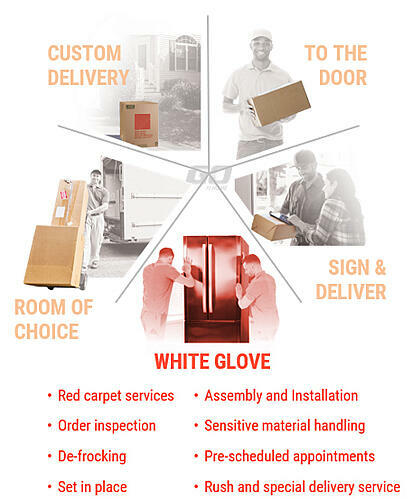 Our white glove services are perfect for handling equipment for medical organizations and other sensitive and priority delivery needs. Our teams are comprised of the trusted professionals you need across the full spectrum of delivery services to be the face of your products. We understand that our team is responsible for upholding the values and established standards associated with your valuable brand. This is especially true in a customer's home. Our team is specifically trained on how to provide the best customer service possible when installing and assembling appliances within the home.